1 A None No Power Seat 1 A is a standard Slimline Business Class seat whose proximity to the lavatory and galleys may be bothersome. There is no floor storage for this seat during takeoff and landing. 1 C None No Power Seat 1 C is a standard Slimline Business Class seat whose proximity to the lavatory and galleys may be bothersome. There is no floor storage for this seat during takeoff and landing. 1 D None No Power Seat 1 D is a standard Slimline Business Class seat whose proximity to the lavatory and galleys may be bothersome. There is no floor storage for this seat during takeoff and landing. 1 F None No Power Seat 1 F is a standard Slimline Business Class seat whose proximity to the lavatory and galleys may be bothersome. There is no floor storage for this seat during takeoff and landing. 10 A None No Power Seat 10 A is a standard Slimline Economy Class seat that has limited recline due to the Exit Row behind. 10 B None No Power Seat 10 B is a standard Slimline Economy Class seat that has limited recline due to the Exit Row behind. 10 C None No Power Seat 10 C is a standard Slimline Economy Class seat that has limited recline due to the Exit Row behind. 10 D None No Power Seat 10 D is a standard Slimline Economy Class seat that has limited recline due to the Exit Row behind. 10 E None No Power Seat 10 E is a standard Slimline Economy Class seat that has limited recline due to the Exit Row behind. 10 F None No Power Seat 10 F is a standard Slimline Economy Class seat that has limited recline due to the Exit Row behind. 11 A None No Power Seat 11 A is a standard Slimline Economy Class seat located in an Exit Row with additional legroom. However, this seat has limited recline due to the Exit Row behind. There is no floor storage for this seat during takeoff and landing. 11 B None No Power Seat 11 B is a standard Slimline Economy Class seat located in an Exit Row with additional legroom. However, this seat has limited recline due to the Exit Row behind. There is no floor storage for this seat during takeoff and landing. 11 C None No Power Seat 11 C is a standard Slimline Economy Class seat located in an Exit Row with additional legroom. However, this seat has limited recline due to the Exit Row behind. There is no floor storage for this seat during takeoff and landing. 11 D None No Power Seat 11 D is a standard Slimline Economy Class seat located in an Exit Row with additional legroom. However, this seat has limited recline due to the Exit Row behind. There is no floor storage for this seat during takeoff and landing. 11 E None No Power Seat 11 E is a standard Slimline Economy Class seat located in an Exit Row with additional legroom. However, this seat has limited recline due to the Exit Row behind. There is no floor storage for this seat during takeoff and landing. 11 F None No Power Seat 11 F is a standard Slimline Economy Class seat located in an Exit Row with additional legroom. However, this seat has limited recline due to the Exit Row behind. There is no floor storage for this seat during takeoff and landing. 12 A None No Power Seat 12 A is a standard Slimline Economy Class seat located in an Exit Row with additional legroom. There is no floor storage for this seat during takeoff and landing. 12 B None No Power Seat 12 B is a standard Slimline Economy Class seat located in an Exit Row with additional legroom. There is no floor storage for this seat during takeoff and landing. 12 C None No Power Seat 12 C is a standard Slimline Economy Class seat located in an Exit Row with additional legroom. There is no floor storage for this seat during takeoff and landing. 12 D None No Power Seat 12 D is a standard Slimline Economy Class seat located in an Exit Row with additional legroom. There is no floor storage for this seat during takeoff and landing. 12 E None No Power Seat 12 E is a standard Slimline Economy Class seat located in an Exit Row with additional legroom. There is no floor storage for this seat during takeoff and landing. 12 F None No Power Seat 12 F is a standard Slimline Economy Class seat located in an Exit Row with additional legroom. There is no floor storage for this seat during takeoff and landing. 14 A None No Power Seat 14 A is a standard Slimline Economy Class seat. 14 B None No Power Seat 14 B is a standard Slimline Economy Class seat. 14 C None No Power Seat 14 C is a standard Slimline Economy Class seat. 14 D None No Power Seat 14 D is a standard Slimline Economy Class seat. 14 E None No Power Seat 14 E is a standard Slimline Economy Class seat. 14 F None No Power Seat 14 F is a standard Slimline Economy Class seat. 15 A None No Power Seat 15 A is a standard Slimline Economy Class seat. 15 B None No Power Seat 15 B is a standard Slimline Economy Class seat. 15 C None No Power Seat 15 C is a standard Slimline Economy Class seat. 15 D None No Power Seat 15 D is a standard Slimline Economy Class seat. 15 E None No Power Seat 15 E is a standard Slimline Economy Class seat. 15 F None No Power Seat 15 F is a standard Slimline Economy Class seat. 16 A None No Power Seat 16 A is a standard Slimline Economy Class seat. 16 B None No Power Seat 16 B is a standard Slimline Economy Class seat. 16 C None No Power Seat 16 C is a standard Slimline Economy Class seat. 16 D None No Power Seat 16 D is a standard Slimline Economy Class seat. 16 E None No Power Seat 16 E is a standard Slimline Economy Class seat. 16 F None No Power Seat 16 F is a standard Slimline Economy Class seat. 18 A None No Power Seat 18 A is a standard Slimline Economy Class seat. 18 B None No Power Seat 18 B is a standard Slimline Economy Class seat. 18 C None No Power Seat 18 C is a standard Slimline Economy Class seat. 18 D None No Power Seat 18 D is a standard Slimline Economy Class seat. 18 E None No Power Seat 18 E is a standard Slimline Economy Class seat. 18 F None No Power Seat 18 F is a standard Slimline Economy Class seat. 19 A None No Power Seat 19 A is a standard Slimline Economy Class seat. 19 B None No Power Seat 19 B is a standard Slimline Economy Class seat. 19 C None No Power Seat 19 C is a standard Slimline Economy Class seat. 19 D None No Power Seat 19 D is a standard Slimline Economy Class seat. 19 E None No Power Seat 19 E is a standard Slimline Economy Class seat. 19 F None No Power Seat 19 F is a standard Slimline Economy Class seat. 2 A None No Power Seat 2 A is a standard Slimline Business Class seat. 2 C None No Power Seat 2 C is a standard Slimline Business Class seat. 2 D None No Power Seat 2 D is a standard Slimline Business Class seat. 2 F None No Power Seat 2 F is a standard Slimline Business Class seat. 20 A None No Power Seat 20 A is a standard Slimline Economy Class seat. 20 B None No Power Seat 20 B is a standard Slimline Economy Class seat. 20 C None No Power Seat 20 C is a standard Slimline Economy Class seat. 20 D None No Power Seat 20 D is a standard Slimline Economy Class seat. 20 E None No Power Seat 20 E is a standard Slimline Economy Class seat. 20 F None No Power Seat 20 F is a standard Slimline Economy Class seat. 21 A None No Power Seat 21 A is a standard Slimline Economy Class seat. 21 B None No Power Seat 21 B is a standard Slimline Economy Class seat. 21 C None No Power Seat 21 C is a standard Slimline Economy Class seat. 21 D None No Power Seat 21 D is a standard Slimline Economy Class seat. 21 E None No Power Seat 21 E is a standard Slimline Economy Class seat. 21 F None No Power Seat 21 F is a standard Slimline Economy Class seat. 22 A None No Power Seat 22 A is a standard Slimline Economy Class seat. 22 B None No Power Seat 22 B is a standard Slimline Economy Class seat. 22 C None No Power Seat 22 C is a standard Slimline Economy Class seat. 22 D None No Power Seat 22 D is a standard Slimline Economy Class seat. 22 E None No Power Seat 22 E is a standard Slimline Economy Class seat. 22 F None No Power Seat 22 F is a standard Slimline Economy Class seat. 23 A None No Power Seat 23 A is a standard Slimline Economy Class seat. 23 B None No Power Seat 23 B is a standard Slimline Economy Class seat. 23 C None No Power Seat 23 C is a standard Slimline Economy Class seat. 23 D None No Power Seat 23 D is a standard Slimline Economy Class seat. 23 E None No Power Seat 23 E is a standard Slimline Economy Class seat. 23 F None No Power Seat 23 F is a standard Slimline Economy Class seat. 24 A None No Power Seat 24 A is a standard Slimline Economy Class seat. 24 B None No Power Seat 24 B is a standard Slimline Economy Class seat. 24 C None No Power Seat 24 C is a standard Slimline Economy Class seat. 24 D None No Power Seat 24 D is a standard Slimline Economy Class seat. 24 E None No Power Seat 24 E is a standard Slimline Economy Class seat. 24 F None No Power Seat 24 F is a standard Slimline Economy Class seat. 25 A None No Power Seat 25 A is a standard Slimline Economy Class seat. 25 B None No Power Seat 25 B is a standard Slimline Economy Class seat. 25 C None No Power Seat 25 C is a standard Slimline Economy Class seat. 25 D None No Power Seat 25 D is a standard Slimline Economy Class seat. 25 E None No Power Seat 25 E is a standard Slimline Economy Class seat. 25 F None No Power Seat 25 F is a standard Slimline Economy Class seat. 26 A None No Power Seat 26 A is a standard Slimline Economy Class seat. 26 B None No Power Seat 26 B is a standard Slimline Economy Class seat. 26 C None No Power Seat 26 C is a standard Slimline Economy Class seat. 26 D None No Power Seat 26 D is a standard Slimline Economy Class seat. 26 E None No Power Seat 26 E is a standard Slimline Economy Class seat. 26 F None No Power Seat 26 F is a standard Slimline Economy Class seat. 27 A None No Power Seat 27 A is a standard Slimline Economy Class seat. 27 B None No Power Seat 27 B is a standard Slimline Economy Class seat. 27 C None No Power Seat 27 C is a standard Slimline Economy Class seat. 27 D None No Power Seat 27 D is a standard Slimline Economy Class seat. 27 E None No Power Seat 27 E is a standard Slimline Economy Class seat. 27 F None No Power Seat 27 F is a standard Slimline Economy Class seat. 28 A None No Power Seat 28 A is a standard Slimline Economy Class seat. 28 B None No Power Seat 28 B is a standard Slimline Economy Class seat. 28 C None No Power Seat 28 C is a standard Slimline Economy Class seat. 28 D None No Power Seat 28 D is a standard Slimline Economy Class seat. 28 E None No Power Seat 28 E is a standard Slimline Economy Class seat. 28 F None No Power Seat 28 F is a standard Slimline Economy Class seat. 29 A None No Power Seat 29 A is a standard Slimline Economy Class seat. 29 B None No Power Seat 29 B is a standard Slimline Economy Class seat. 29 C None No Power Seat 29 C is a standard Slimline Economy Class seat. 29 D None No Power Seat 29 D is a standard Slimline Economy Class seat. 29 E None No Power Seat 29 E is a standard Slimline Economy Class seat. 29 F None No Power Seat 29 F is a standard Slimline Economy Class seat. 3 A None No Power Seat 3 A is a standard Slimline Business Class seat. 3 C None No Power Seat 3 C is a standard Slimline Business Class seat. 3 D None No Power Seat 3 D is a standard Slimline Business Class seat. 3 F None No Power Seat 3 F is a standard Slimline Business Class seat. 30 A None No Power Seat 30 A is a standard Slimline Economy Class seat. 30 B None No Power Seat 30 B is a standard Slimline Economy Class seat. 30 C None No Power Seat 30 C is a standard Slimline Economy Class seat. 30 D None No Power Seat 30 D is a standard Slimline Economy Class seat. 30 E None No Power Seat 30 E is a standard Slimline Economy Class seat. 30 F None No Power Seat 30 F is a standard Slimline Economy Class seat. 31 A None No Power Seat 31 A is a standard Slimline Economy Class seat. 31 B None No Power Seat 31 B is a standard Slimline Economy Class seat. 31 C None No Power Seat 31 C is a standard Economy Class seat whose proximity to the lavatories and galley may be bothersome. 31 D None No Power Seat 31 D is a standard Economy Class seat whose proximity to the lavatories and galley may be bothersome. 31 E None No Power Seat 31 E is a standard Slimline Economy Class seat. 31 F None No Power Seat 31 F is a standard Slimline Economy Class seat. 32 A None No Power Seat 32 A is a standard Slimline Economy Class seat in the last row of the plane and may have limited or no recline. The close proximity to the lavatories and galley may be bothersome. This seat is missing a window. 32 B None No Power Seat 32 B is a standard Slimline Economy Class seat in the last row of the plane and may have limited or no recline. The close proximity to the lavatories and galley may be bothersome. 32 C None No Power Seat 32 C is a standard Slimline Economy Class seat in the last row of the plane and may have limited or no recline. The close proximity to the lavatories and galley may be bothersome. 32 D None No Power Seat 32 D is a standard Slimline Economy Class seat in the last row of the plane and may have limited or no recline. The close proximity to the lavatories and galley may be bothersome. 32 E None No Power Seat 32 E is a standard Slimline Economy Class seat in the last row of the plane and may have limited or no recline. The close proximity to the lavatories and galley may be bothersome. 32 F None No Power Seat 32 F is a standard Slimline Economy Class seat in the last row of the plane and may have limited or no recline. The close proximity to the lavatories and galley may be bothersome. This seat is missing a window. 4 A None No Power Seat 4 A is a standard Slimline Business Class seat. 4 C None No Power Seat 4 C is a standard Slimline Business Class seat. 4 D None No Power Seat 4 D is a standard Slimline Business Class seat. 4 F None No Power Seat 4 F is a standard Slimline Business Class seat. 5 A None No Power Seat 5 A is a standard Slimline Business Class seat. 5 C None No Power Seat 5 C is a standard Slimline Business Class seat. 5 D None No Power Seat 5 D is a standard Slimline Business Class seat. 5 F None No Power Seat 5 F is a standard Slimline Business Class seat. 6 A None No Power Seat 6 A is a standard Slimline Business Class seat. 6 C None No Power Seat 6 C is a standard Slimline Business Class seat. 6 D None No Power Seat 6 D is a standard Slimline Business Class seat. 6 F None No Power Seat 6 F is a standard Slimline Business Class seat. 7 A None No Power Seat 7 A is a standard Slimline Business Class seat. 7 C None No Power Seat 7 C is a standard Slimline Business Class seat. 7 D None No Power Seat 7 D is a standard Slimline Business Class seat. 7 F None No Power Seat 7 F is a standard Slimline Business Class seat. 8 A None No Power Seat 8 A is a standard Slimline Economy Class seat located at a moveable curtain-style bulkhead. 8 B None No Power Seat 8 B is a standard Slimline Economy Class seat located at a moveable curtain-style bulkhead. 8 C None No Power Seat 8 C is a standard Slimline Economy Class seat located at a moveable curtain-style bulkhead. 8 D None No Power Seat 8 D is a standard Slimline Economy Class seat located at a moveable curtain-style bulkhead. 8 E None No Power Seat 8 E is a standard Slimline Economy Class seat located at a moveable curtain-style bulkhead. 8 F None No Power Seat 8 F is a standard Slimline Economy Class seat located at a moveable curtain-style bulkhead. 9 A None No Power Seat 9 A is a standard Slimline Economy Class seat. 9 B None No Power Seat 9 B is a standard Slimline Economy Class seat. 9 C None No Power Seat 9 C is a standard Slimline Economy Class seat. 9 D None No Power Seat 9 D is a standard Slimline Economy Class seat. 9 E None No Power Seat 9 E is a standard Slimline Economy Class seat. 9 F None No Power Seat 9 F is a standard Slimline Economy Class seat. Complimentary beverages are provided on all flights. Snack and meal service varies depending on the length of route. The Airbus A320neo operates on a variety of domestic and European short- and medium-haul routes. 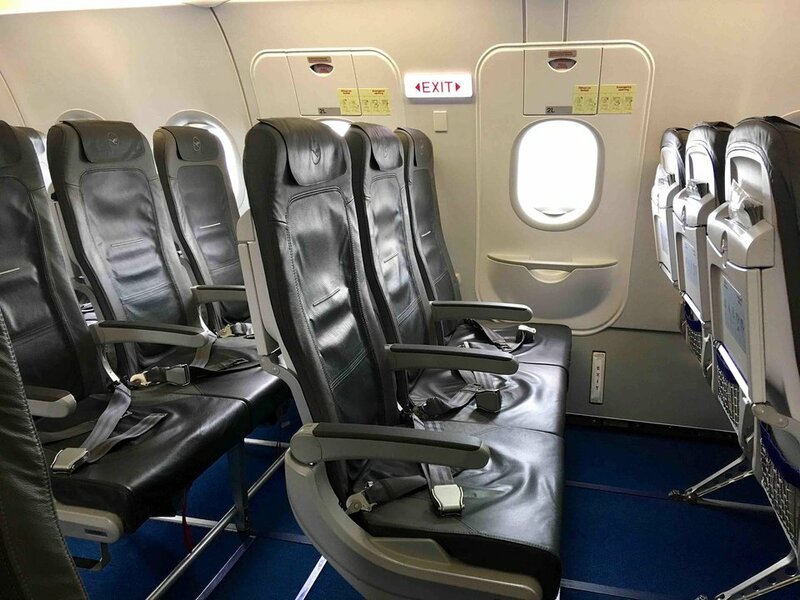 This aircraft is the newest configuration of this aircraft type and seats range from rows 1-32. This aircraft operates in a Business and Economy Class configuration. The number of seats per cabin is variable and may have as few as three rows of Business Class to a maximum of seven. The maximum size of Business Class is illustrated in this map. Business Class seats are the same as Economy with the middle seat left empty. Exceptionnal seat with plenty of legroom. Seats are comfy and recline well. Meal service is very good. Row 12 is surely the best row of the aircraft. Seats in row 1 D,E,F of this aircraft have more legspace than 1 A, B,C. To get maximum legspace, choose the right side D,E,F. The seat is misaligned with the central aisle so everyone boarding hits the seat and your shoulder as they move past with luggage etc. Very unpleasant. Horrible. It was their newest aircraft, one of the 5 Airbus 320 NEO they've purchased. I've had an emergency row seat, yet I had no legroom (I'm 5"11", so not terribly tall). The seats are super thin, feels like sitting on a park bench. They are exactly the same in economy and business (I don't envy people that paid the business class price for that). Service is great, but I'd rather have food and alcohol for purchase than seat on those awful seats for 2 hours. My entire body went numb. This seat was good, on my flight from Frankfurt to Barcelona. Just gotten off my flight from LA, and not being able to sleep properly, I got on this flight a bit dazed. But the seat was really comfortable and, pretty wide, compared to other planes like the A318 or A319. This seat was a good choice, since I arrived in Barcelona well rested. This seat is terrible, the fuselage of the airplane is getting narrow back there, reducing the space for shoulders. The pitch is also to short, my knee was permanently against the seat before me and that hurt. Avoid the last three rows on the A320neo, they have only 29 inches of pitch, it is quite horrible. If you have luggage for the overhead bins, sit no further back than row 28, as space is used for crew stowage. The two lavatories at the back are a joke, they are so narrow I'm surprised they are not deemed as safety hazards. This configuration is horrible. The staff told me that the last three rows are even more condensed. Here I sat with virtually no legroom as a 190 guy. The old one was bareable, this one is horid. It feels, as there is more legroom in the Business Class section behind the bulkhead, than in the old configuration. Last row in Economy does not have windows and, due to the curvature of the fuselage, the seats are somewhat more narrow than the rest.So, avoid last row! The toilets in the rear are horribly small. 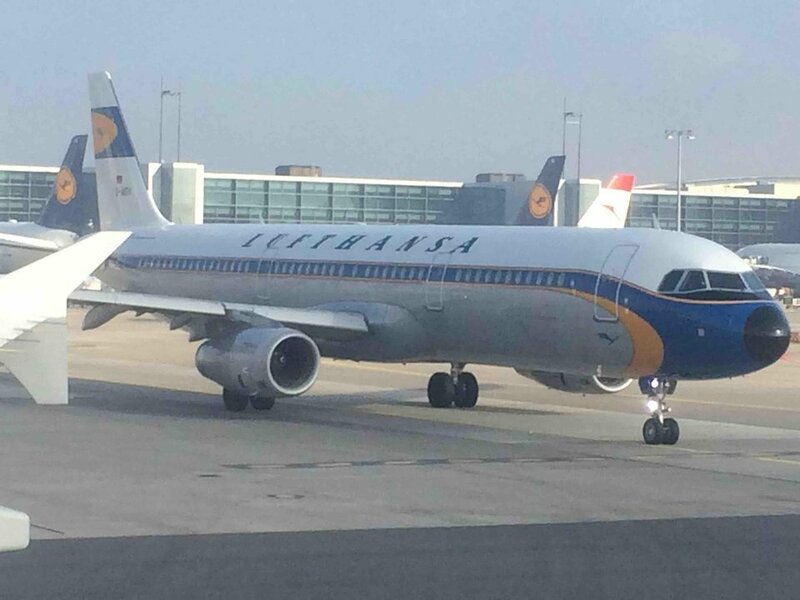 Lufthansa flies 2 versions of Airbus A320-200 NEK.